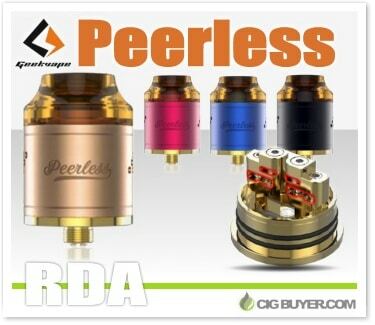 Another innovative atomizer from Geekvape, the Peerless RDA has a uniquely designed two-post, triple terminal build deck that’s setup to accommodate both large and small coil leads. The unique positioning, design, and screw shape allows for flexible and intuitive mounting, with 9 airflow holes on each side to fully customize your vape. The Peerless RDA offers enormous capacity with a large 10mm deep juice well and includes a proprietary PEI 10mm bore drip tip, along with a delrin 810 drip tip fitted top cap. It’s also squonk-compatible and includes a special 510 squonk pin.